Side assemblies are dry assembled to create mortises for drawer web frames. Front stiles will have mortise and tenons. I had planned to use exposed sliding dovetails, but along the way I decided to have a small reveal between the legs and set back for frames and drawer fronts. So mortise and tenons it will be. 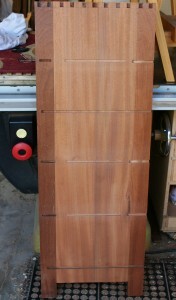 Back stiles will use sliding dovetails which will be hidden by the back element. 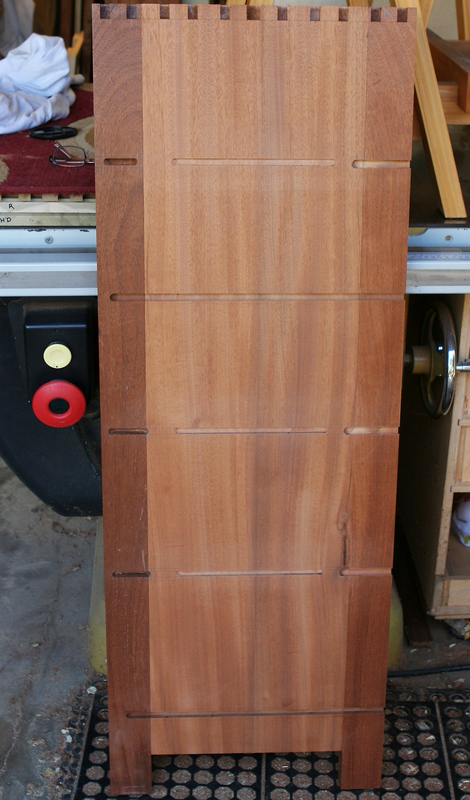 Sides drawer runners (rails) will M&T into front (glued) and to rear stiles (no glue to allow case to expand/contract). These have stopped shallow dadoes (1/4 inch) into the side assemblies. The upper web frame also has a center runner to provide support for the two side by side narrow drawers. This will be similarly use mortise and tenon into front and back stiles.